If car drivers knew more about the impacts of their travel decisions, would they modify them, hop on a bike or skip a trip? Does developing housing near rail stations (Transit Oriented Development) change travel habits or decrease car ownership? And, how can groups with opposing political views find common ground and move forward? These questions and more are the subject matter of the Fall issue of ACCESS Magazine, edited by Donald Shoup, Distinguished Professor of Urban Planning, Emeritus, at the UCLA Luskin School of Public Affairs. Most people are aware that car emissions harm the environment, but they continue to drive anyway. What would it take for people to drive less and use other means of travel more? Authors Sengupta and Walker try to get people to walk, bike, and take transit more through the use of a new program, Quantified Traveler. With this program, respondents were able to track their travel behavior and compare it with their peers and the national average. The newfound awareness of individual habits, especially in comparison to others, lead to driving distances dropping and respondents showing an actual change in their attitude towards travel. You’ve probably seen them in most major cities: bikes readily available for checkout, used by commuters and tourists alike. But how are bikesharing programs influencing other forms of travel? Are you more likely to take the bus if you also share a bike? Shaheen and Martin surveyed bikesharers in four major cities to see how their travel behavior changed over the course of time. They discovered that, aside from biking more, bikesharers also drive less and own fewer vehicles. In addition, bikesharing serves as an important first- and last-mile connector for public transit. Developing housing near rail stations is expensive, but it’s supposed to encourage people to walk, bike, and take transit. Does it? Chatman explores the effect of rail on people’s travel habits. When all other factors were considered (bus access, job and population density, and housing type, etc. ), rail access had no effect on auto ownership. What did have an effect? Parking availability. There is little research on the impact of TODs on the environment and household costs. There is even less research on the impacts of building TODs. For that reason, Nahlik and Chester developed an assessment to measure these impacts. The authors evaluated redevelopment around LA Metro’s Gold and Orange lines, including emissions from the rehabilitation of nearby buildings, changes in household energy use, and reductions in automobile use as households shift to alternate travel modes. The result was that proposed developments could reduce GHG emissions by over 35 percent compared with business-as-usual developments. The upfront costs to construct these TODs would be offset by emission reductions over time from residents who are able to change their behaviors and break away from car-dependent habits. After World War II, states were provided with a 90 percent federal match for the construction of freeways meant to penetrate urban cores, clear out slums, and renew central business districts. By the late 1960s, however, this love affair with the freeway ended as citizen protests forced public officials to reassess the effects of their intruding highways. “Changing Lanes,” based on the book by the same name, explores the controversy, racism, and the legal battles associated with some of these urban highways. As several cities plan on demolishing their urban highways for other creative developments, DiMento and Ellis examine possible opportunities for them, including a chance for more public transit. We’ve all been in an argument where neither side seems to be listening to the other. We start trying to “win” instead of figuring out a solution that works. This is even truer when dealing with people who ideologically opposed to our own views. So how do we move forward? Especially when the political process is involved? Karen Trapenberg Frick emphasizes the importance of finding any areas of common ground in order to move forward. In the course of the author’s political planning research, there were always areas where both sides of an argument could agree. Whether it was electric vehicles not paying their fair share of transportation costs, or questioning the wisdom of running costly rail lines in low-density areas, there was always a common ground to be found if participants considered their opponents as legitimate adversaries rather than as enemies unworthy of engagement. ACCESS Magazine is published by the University California Center on Economic Competitiveness in Transportation (UCONNECT), and is housed at UCLA’s Luskin School of Public Affairs and the Institute of Transportation Studies. The latest issue of ACCESS magazine is now available online at accessmagazine.org. “Informal Parking: Turning Problems Into Solutions,” is an article written by former EIC and recently retired Urban Planning professor, Donald Shoup. In honor of his work and dedication to the Luskin over the past 41 years, a special tribute website was created to celebrate his legacy. This site features the story of Shoup’s game-changing research in urban planning, along with anecdotes from his supporters (fondly labelled “Shoupistas”) and information about his books and publications. ACCESS Magazine is housed in the Institute of Transportation Studies and features research funded by the UC Center on Economic Competitiveness. The magazine has been publishing since 1992, and it took home the 2014 National Planning Award for a Communication Initiative from the American Planning Association. Though she remembers her childhood fondly, playing field hockey, becoming head girl of her high school, and obtaining the highest honor as a Queen’s Guide in the equivalent of Girl Scouts, her environment had always been sensitive to the history of the “troubles” that partitioned Ireland in 1921. Although she loved Northern Ireland, which was peaceful when she grew up there, she chose to go to the University of St. Andrews, Scotland, and remembers feeling lucky to study in such a beautiful medieval town. A year after graduating, Pat met a young American named Donald Shoup when her brother invited him to their parents’ house in Northern Ireland. The whole family fell in love with Donald, including Pat. After he returned to the U.S., she and Donald wrote to each other for two years. In 1964 they arranged to meet again in Heidelberg, Germany, where she was teaching English at a Berlitz School. That summer they became engaged, and in 1965 she emigrated to the United States, a journey that would mark a turning point in her life and career. When she landed in New York, Pat Shoup was 25 years old and excited to embark on a new journey, a journey that began with a Humber bicycle constructed for her by Donald from a kit. Having left everything behind, Shoup said she was in need of a job and attempted to continue her teaching career by taking a summer MAT course at Yale. After struggling through a temporary job trying to teach American history, she realized teaching was not for her. In 1968, Shoup and her husband moved to California when when he won a postdoctoral appointment at UCLA, and she began her career as an editor for academic journals by working freelance for Sage Publications. When the University of Michigan appointed her husband an assistant professor, she worked for the university press in Ann Arbor and was the editor for the 1970 Survey of Consumer Finances. When the couple moved back to Los Angeles, Pat worked on campus for various journals, including Law & Society Review at the UCLA Law School and The Journal of Symbolic Logic, as well as doing freelance jobs for the university press. Though she has edited numerous academic journals, Shoup’s passion for writing lies in fiction and poetry. Some of her poetry has been published, and one of her poems was published in a collection of works selected by Ted Hughes and Seamus Heaney. Pat and Donald Shoup edited The High Cost of Free Parking together and she has played a key role in its success. She has also played a role in funding the Donald and Pat Shoup Endowed Fellowship in Urban Planning. Professor Donald Shoup to Retire in June The popular professor of urban planning has taught at UCLA for 41 years. 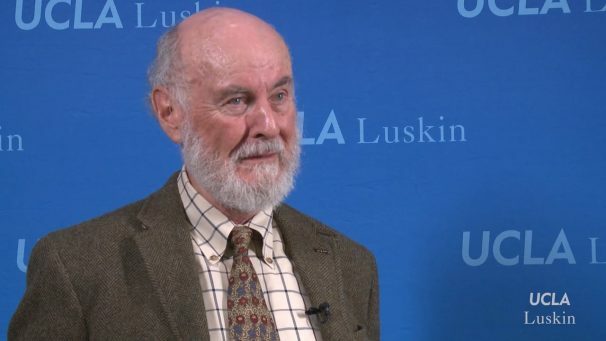 After 41 years of teaching at UCLA, Donald Shoup, distinguished professor of Urban Planning, will retire on June 30, 2015. 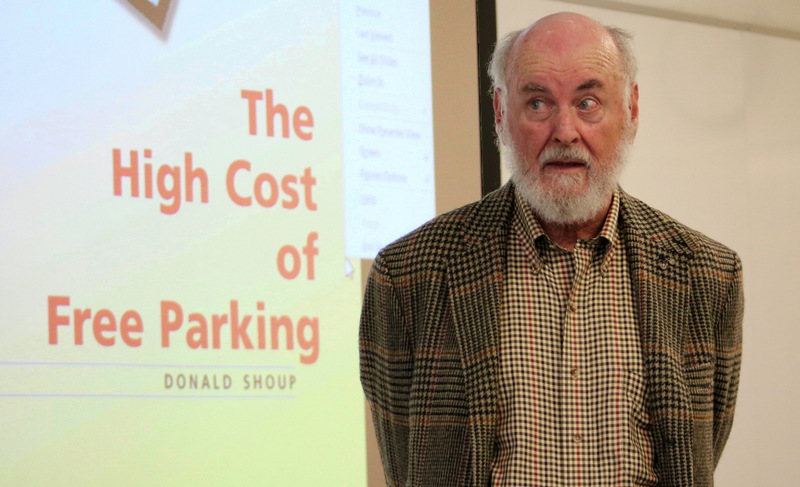 Shoup is widely known as the “parking guru” whose ideas on parking policies have been implemented in cities around the world. His influential book, The High Cost of Free Parking, has led a growing number of cities to adapt new policies for parking requirements and to charge fair market prices for curb parking. Shoup’s revolutionary ideas have gained an international following of students, alumni and urban planning professionals. Shoup has been a visiting scholar at Cambridge University and the World Bank, and has served as Director of the Institute of Transportation Studies at UCLA. The one-time Chair of Luskin’s Urban Planning department also serves as editor of ACCESS, a transportation magazine published by the University of California. Read about Shoup’s legacy at UCLA. A retirement celebration honoring Shoup will be held on Saturday, May 30. More details and information on how to attend will be announced in the coming weeks. To learn more about Donald Shoup, visit our tribute page.